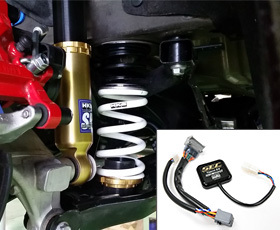 The stock electronic control shock absorber makes FK8 all-rounder for a various driving conditions; however, for the sporty driving, especially in a circuit, excessive vehicle body roll and/or pitch and rear side’s instable vehicle body movement while braking may be a matter of concern. This products lowers the vehicle height to with this product to lower its gravity center and reduce the instable vehicle body movement and body roll; circuit driving will be enjoyed with higher reliability. 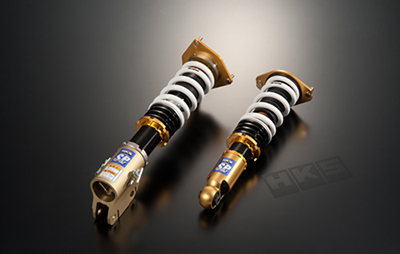 HKS original camber adjustable pillow upper is installed to the front side. 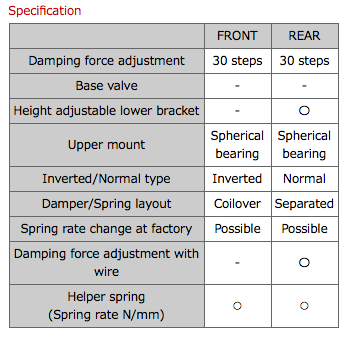 The camber can be adjusted according to the tire size and/or driving conditions. High rigidity single tube inverted type is utilized for the front side to support sufficiently its weight and large bending load that is caused during acceleration, deceleration, and/or turning. It delivers outstanding durability that was achieved through our continued efforts for improvement. With the stock wheel, the tire may come in contact with the damper around the handle lock point if the tread length is shorter than 42mm, or they may come in contact depending on the wheel rim width and/or offset setting.